“Paraísos Desplegables” [Pop-up Paradises] is 640-sq.mt. 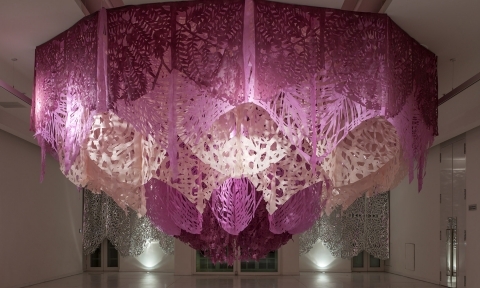 installation by Manuel Ameztoy that was commissioned by the Faena Art Center. 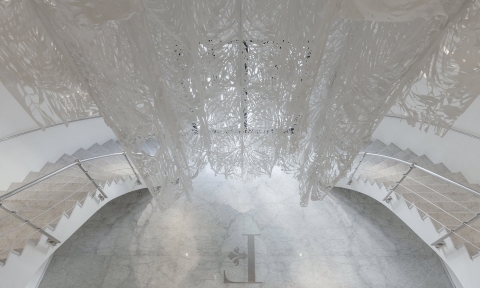 Conceived specifically for Faena’s Catedral exhibition hall, the work consists of hand-cut openwork textiles. The exhibition also includes a video of the same installation in the marshes of the Entre Ríos province which was its original source of inspiration. Manuel Ameztoy (La Plata, 1973) first studied drawing at the Escuela Nacional de Bellas Artes Prilidiano Pueyrredón. In 1995, he left that institution for one year in order to study at the Escuela Nacional de Artes Plásticas San Carlos, in Mexico, where he took classes in experimental printmaking with María Eugenia Quintanilla. While in Mexico, he became familiar with the various uses of garlands for the Day of the Death festivities. 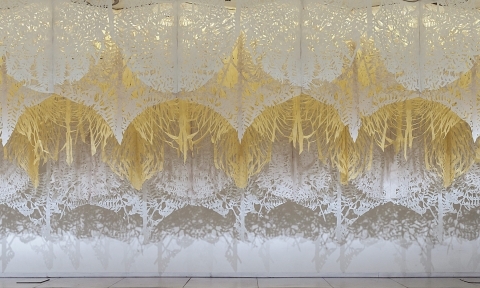 Since then, non-textile paper cutouts have been a mainstay of his art. In 2004, he was awarded a mention at the LVIII Salón Nacional de Rosario Museo Castagnino. That same year, thanks to the piece he made for the exhibition Onírico y Privado held at the Fundación Telefónica, Ameztoy became a fundamental figure on the Buenos Aires contemporary art scene. Works in tissue paper in large acrylic boxes were the cornerstone of his solo exhibitions Los Ultimos Reyes (2006) and El Rey (2005), both held at Galería Braga Menéndez Arte Contemporáneo. Additional solo exhibitions include Las Fuentes del Nilo at Galería Cecilia Caballero y Chez Vautier (2011) and Cortar y Pegar at Fundación PROA (2011). In those exhibitions, Ameztoy presented his works with layers of paper in different formats (framed and hanging). In 2005, he participated in the Barrio Joven stand at ArteBA, and in 2008 in the Arteprima section of the Milan Art Fair, MIART Art Now!. Thanks to constantly evolving work in which paint and paper come together to create chromatically striking installations, he was invited to participate in the 2011 edition of Pinta New York. His work forms part of institutional collections at the Museum of Latin American Art in Los Angeles and MACRO (Museo de Arte Contemporáneo de Rosario), among others, as well as major private collections in Argentina, Brazil, the United States and Europe. Since 2003, Ameztoy has been an adjunct professor in the “Taller proyectual de pintura” program directed by artist Elsa Soibelman at the Instituto Universitario Nacional de Arte (IUNA). Since 2010, he has formed part of the Escuela de Proyectos. At the Escuela de Proyectos, which is coordinated by Laura Messing, artists Augusto Zanella, Sergio Bazán, Andrea Juan and Horacio Zavala deploy their talent and experience to further the education of emerging visual artists. He lives and works in Buenos Aires and Entre Ríos.